Over the course of a three-week jaunt to the Republic of Ireland, I wandered from the shore of the Irish Sea in the east to the shore of the Atlantic Ocean in the west, with a memorable day in Northern Ireland tossed in for good measure. During that time, I was continually lured into many of the country’s dynamic churches, each of which seemed to offer something unique. I stood next to the relics of St. Valentine in Whitefriar Street Carmelite Church in Dublin. I climbed to the top of one of only two ninth-century round towers in the country at St. Canice’s Cathedral in Kilkenny. I touched the hand of an exposed mummy (alleged to be that of a Crusader) in the crypts of St. Michan’s Church in the Irish capital. And in every church I entered, I just soaked in its beautiful architecture and its religiosity. These are my favorites. 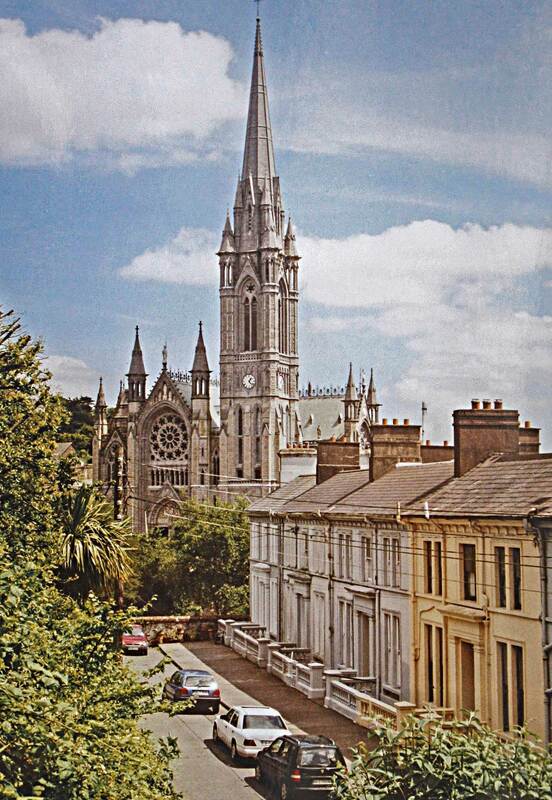 Atop one of the steep hills that slope down to the lower part of Cobh, St. Colman’s, a wonderfully elaborate Roman Catholic cathedral, dominates and watches over this inviting town. High above the colorfully painted houses that march down to the harbor in an orderly row, St. Colman’s is a neo-Gothic masterpiece, built over a span of 47 years and completed in 1915. Funded by locals and by Americans and Australians of Irish descent who sent money back to their homeland, the cathedral features a controlled riot of gargoyles, pinnacles, finials, spirelets, flying buttresses, and a soaring spire atop the bell tower that houses a 49-bell carillon, the largest in Ireland. At the entrance, I admired the statuary above and around the doors as well as the spectacular rose window and its intricate tracery. Inside, the main aisle of mosaic Celtic knots and simple shamrocks took me past red and white marble columns that support Gothic arches with spandrels sculpted with Biblical scenes among countless shamrocks. A clerestory punctuated with stained-glass windows, and oak and pitch pine for the pews, vaulted ceiling, complex pulpit, and organ casing warmed the nave. The prolific details in the sanctuary kept my eyes entertained until lights began to be switched off as a gentle nudge for visitors to leave for the day. Between its sumptuous interior, elegant exterior, and unbeatable setting, St. Colman’s Cathedral is by far the most beautiful church I saw in all of Ireland. Just a couple of blocks off the River Lee, this Anglican cathedral is named for the saint who founded a monastery on this same spot in 606. The current cathedral — the third one constructed here after previous incarnations as a medieval and then a classical cathedral — was completed in 1879. Built of Cork limestone and surrounded on three sides by grassy paths and a small cemetery of old tombstones and Celtic crosses, the cathedral can be viewed from all angles, making it easy for me to appreciate the work of the single architect who designed everything, from the three formidable towers and the more than 1,200 sculptures right down to the furniture inside, making Saint Fin Barre’s a prime example of architectural unity. The deeply recessed front doors with fanciful ironwork, topped with a tympanum depicting the Parable of the Ten Virgins, welcomed me into the bright and rich interior. The marble mosaic floor originating from the Pyrenees, the colorfully painted sanctuary ceiling, the squat pulpit, and the fantastic bishop’s throne revealed the genius of a single individual. But I was most impressed by the magnificent stained-glass windows portraying scenes from the Old and New Testaments. 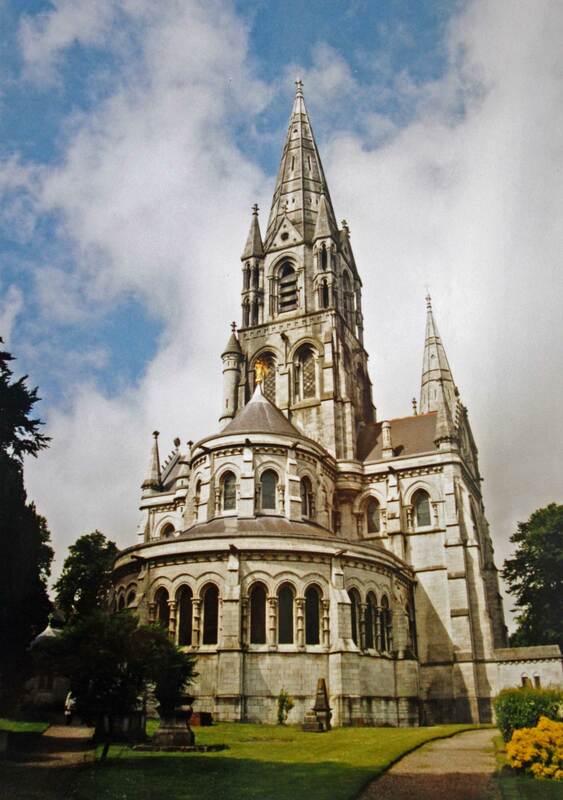 The vibrancy of the colors, particularly in the windows in the semicircular ambulatory, where the windows were lower and I could observe them more easily, was astounding, helping to make Saint Fin Barre’s one of Cork’s best attractions. Founded in 1795 as the national seminary for Ireland, St. Patrick’s College (now a part of the National University of Ireland) was once the largest seminary in the world and has been graduating priests for more than two centuries. Passing onto the grassy quad completely framed by the college’s buildings, I was lured closer to the campus’ keystone — the neo-Gothic chapel, consecrated in 1891 and completed in 1905. The style is deceptive: Despite its exquisite rose window, Gothic windows, and finely tapered spire that almost outsizes the chapel itself, inside I did not find the typical Gothic design of nave, columns, and side aisles. Rather, the single passage toward the altar was flanked by carved oak choir stalls that can accommodate 454 singers in four tiers — the largest stalled choir chapel in the world. It’s a magnificent feature, bathed in golden light. 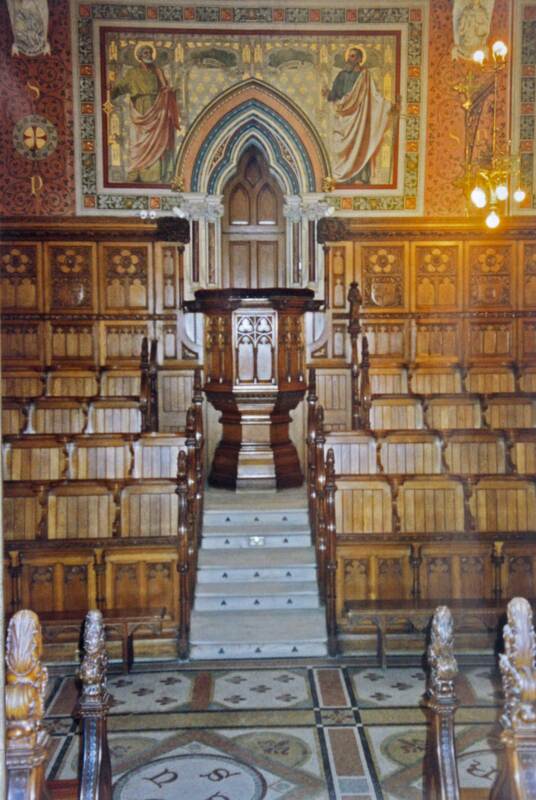 Behind the stalls, more fine carvings of figures representing Biblical characters, of the arms of the Irish dioceses, and of ornamental designs lined the walls. Looking up or down became a difficult choice: Above, a network of panels in painted medallions on canvas attached to a wooden ceiling composed a heavenly procession toward the altar; below, the floor of marble mosaic included figures and words that provide lessons in Christianity. Now open to the public by appointment only, the chapel’s glorious interior will make this one of your best reservations in Ireland. 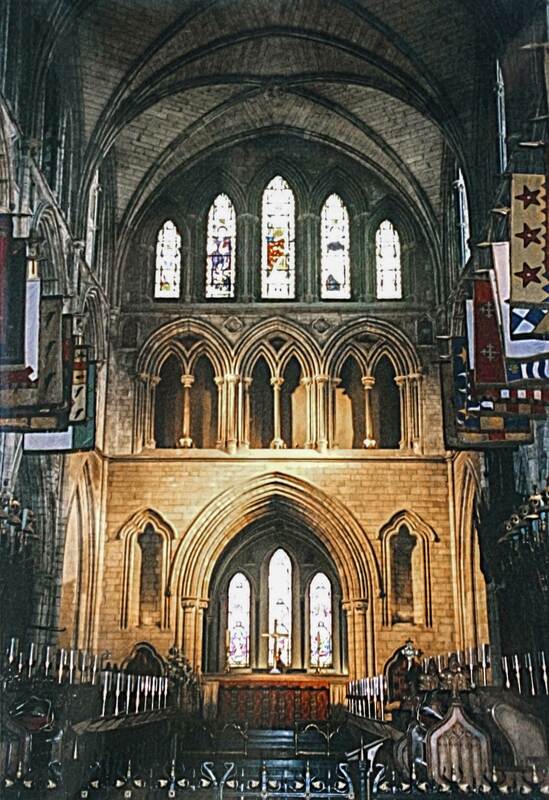 With parts of the cathedral dating back to 1220, St. Patrick’s is steeped in history and superlatives. It’s the largest cathedral in the country, and everyone from William of Orange to Queen Victoria visited here. Jonathan Swift, who was dean of the church for 30 years in the first half of the 1700s, is buried on the grounds. But its origins reach back even farther, to 450, when Saint Patrick, the patron saint of Ireland, baptized people into Christianity on this very site. For many centuries, the cathedral was the island’s largest enclosed space, and it was fairly simple for me to lose myself in the tremendous interior. I walked down the extraordinarily long central aisle along a colorful mosaic floor of various designs that contrasted nicely against the uniform gray of the stonework. A spiral staircase with marble columns, deep transepts with wonderful stained glass, finely carved choir stalls, soaring columns, and three statues of St. Patrick vied for my attention. Countless pointed arches, designed to draw the eye upward toward God, bore a touch of irony — the archbishop largely responsible for the construction of this cathedral went blind before its completion and never got to see his final product. I like to think the man upstairs compensated him with centuries of worshippers and visitors who have enjoyed this visual feast that he provided. 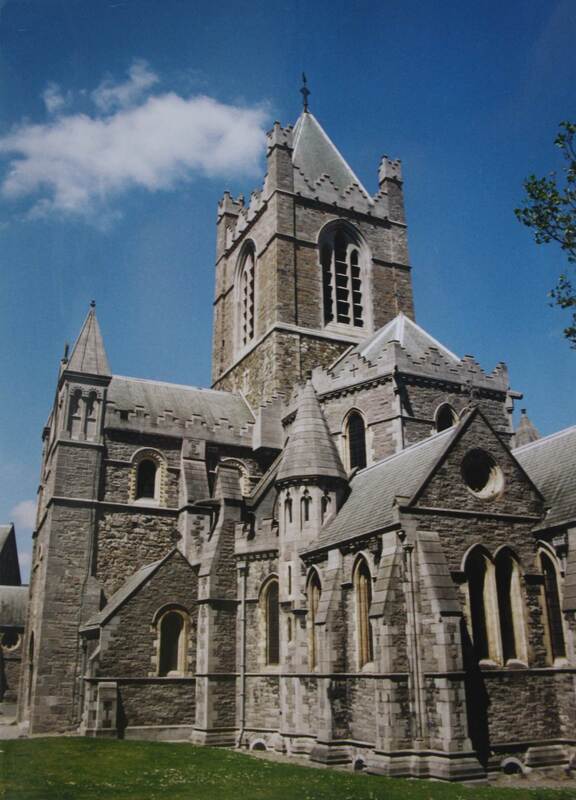 Set in the heart of the ancient Viking city, Christ Church Cathedral dates back to the 1180s, making it Dublin’s oldest edifice. From the outside, this beautiful building is undeniably medieval: somewhat austere and somber, with sturdy buttresses but no statuary or enormous windows; very masculine; very solid. Given that, I was rather taken aback when I entered and was greeted by an unexpected airiness and lightness. Graceful stained-glass lancet windows allowed in a flood of light that supplemented the simple hanging lanterns. Elaborately sculpted choir stalls, a delicate choir screen, a highly ornamented pulpit, a colorful mosaic floor of intriguing patterns, a ribbed vault ceiling, wide arches, and magnificent embroidered altar frontals exuded an ancient holiness. But to get an even better feel for what this place was like 1,000 years ago, I headed underneath it all to the oldest part of the cathedral — a fascinating crypt, the largest in all the British Isles, that stretches under the building’s entire length and width and has enough room for a café where you can enjoy a wee bit of Irish tea and tremendous volumes of Irish history among the stone arches, low ceiling, and monuments.